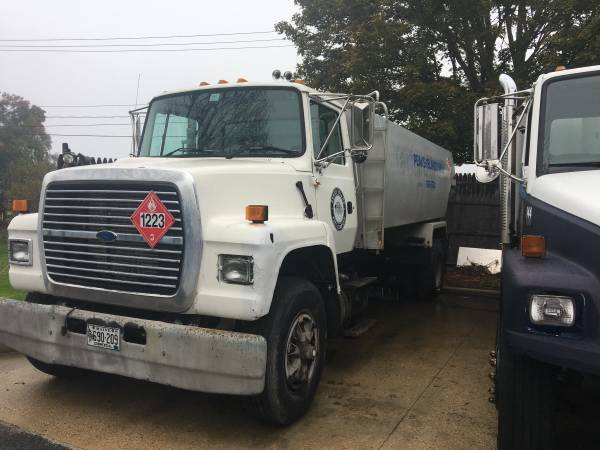 1997 ford L8000 oil delivery tank truck. Truck has 21,000 original miles. I’ve had it for 18 years. Single pocket 3200 gallon tank. Has Ford (New Holland) in line six diesel, with reman Bosch power head that was $6,000 last year. Runs and drives great, everything works. Body is in great shape beside passenger step needs to be replace and windshield is cracked. Truck took a sticker in 2015 but hadn’t been used much since then. No issues it can go down the road fine and work right now I just want to buy something newer to match the other fuel trucks I have.